Does what's needed,as a new battery should. Hope it lasts eight years, like the previous Varta did. Fitted to my R90s, Had a slight problem as there was no charging instructions. A phone call later, and its 1amp or less. My charger is 0.8A, for motorbikes, and it took about 20hrs to fully charge This could cause problems if a high amperage charge is used. As my bike has been off the road for 20 years the battery took quite a hammering due to initial firing up, and the setting up the carbs, The battery is great, it withstood more than a normal battery, with still some left. I would have no hesitation in recommending the battery, but watch how you charge it. Mike. Well it fired my bike up, but time will tell. Word on the street is these are the D's B's and tired of wasting money on the other ones that die so easily! Early days. But bike starts and runs. Delivery was prompt. Unusual battery terminals. Not seen them before. But all works well. I took the advice given over the phone to check I was ordering the right battery. The battery arrived in good time, I fitted it to the vehicle which started straight away. Job done! Thanks for the great service. I cannot fault the speed of delivery. Ordered just before Xmas 2014 and arrived the following day. Astonishing given the parcel furore at that time and the fact I apparently live in outer reaches of space according to most carriers. The Black Isle, just north of Inverness. Superb service. Brilliant battery. Ideal for Tonti-framed Guzzis - with minor adjustment to the terminals / wiring. 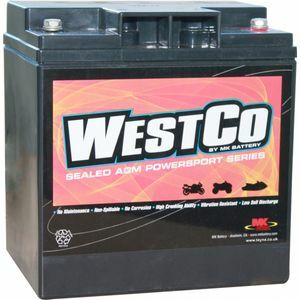 Very heavy high power battery, no maintenance, leak proof and easier to fit than stock battery. Arrived next day as stated, beautifully packed and perfect fit on bike. Super service and would definately use you again.